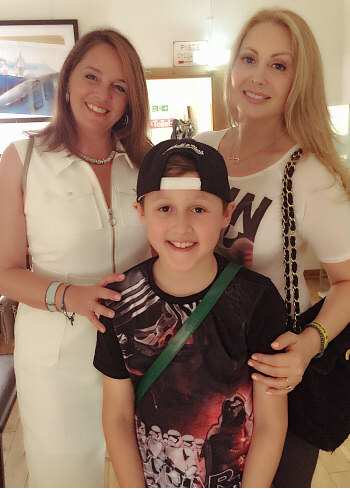 I had the pleasure of being invited to a private viewing and launch party on Friday 29th July which was the opening night and the first art exhibition of its kind where ALL the artists are vegan. The exhibition is being held at Karamel the award winning vegan restaurant rumoured to serve the best vegan pizza in town. 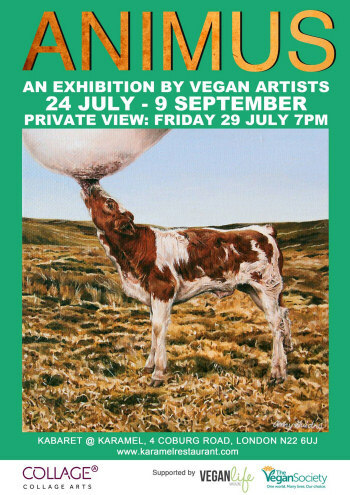 The exhibition is supported by the Vegan Society and Vegan Life magazine and curated by Louise Wallis, ANIMUS explores vegan identity, specifically human treatment of other animals using startling, sensitive and surreal images of animals. The exhibition features world-renowned vegan artists like British graphic artist Sue Coe, considered a respected political artist whose award-winning work has been published in The New York Times, the New Yorker, and Rolling Stone; Canadian photographer Jo-Anne McArthur (subject of award-winning documentary The Ghosts in Our Machine) and Spanish illustrator Roger Olmos, whose work has drawn praise from Dame Jane Goodall, also feature prominently. Now thankfully veganism is the topic of the new century and I’ve seen awareness and an ever increasing focus, from vegan topics including vegan athletes to vegan celebrities, vegan festivals and vegan restaurants openings to magazines devoted to just veganism. However, I’ve never known veganism to be shown through art before. Although I knew it would probably be both upsetting and thought provoking, I couldn’t wait to view it. Many types of animals had been drawn, painted and photographed beautifully all with accompany stories that all tell their true individual life stories. 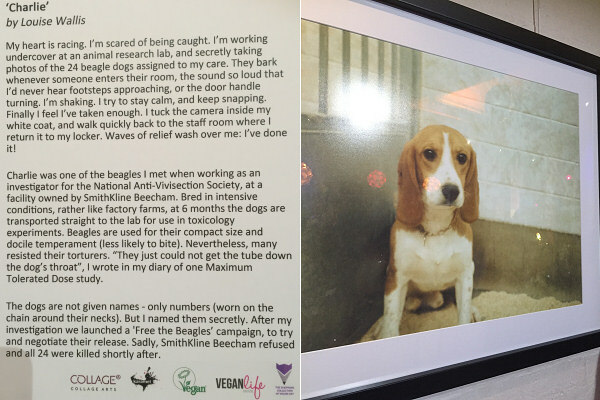 One picture in particular I found really upsetting was taken by Louise Wallis who was working undercover in an animal testing research laboratory. She photographed a beagle whom she had named Charlie. Every year globally tens of billions of sentient beings die on the production line mostly without the rest of the world knowing or caring in the name of ‘food and materials’. ANIMUS shows this in a way that many people whom may not have known or even been interested before will get the chance to see beautiful art while understanding what happens to animals on a daily basis. The exhibition certainly not a ‘feel good’ experience but it is that of immense feeling and insight to what actually happens to our animal friends therefore this exhibition is very much needed in my eyes. Oh and I can vouch for the vegan pizza too, it was delicious!